Searching for a remodeling contractor who specializes in building cabinetry to fit your space? If you are looking for "just the right piece" to fit space in your home, you've just found a local carpenter for the job. All City Construction and Remodeling specializes in creating beautiful custom cabinetry, including kitchen cabinets, bathroom vanities, entertainment centers, built-in bookcases, fireplace surrounds and mantles, and bars. 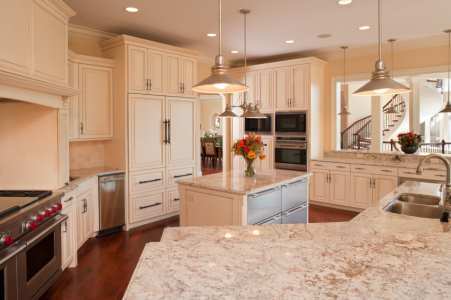 All City Construction and Remodeling has been designing, building, and installing custom cabinetry since 1999. If you've shopped the home center stores and can't find what you're looking for, All City Construction and Remodeling can create a custom cabinet solution. Whether your home is formal, contemporary, or funky, All City Construction and Remodeling will create beautiful, enduring pieces that will fit right in. Our skilled carpenters have 20 years of experience creating unique custom cabinetry. We use quality hardwood for all of our work. Let our designers show you examples from our extensive portfolio. You can choose the perfect cabinet style. Then, select the right wood, stain or paint, and hardware to create a custom cabinet solution. We've been building custom cabinetry for 20 years. All City Construction and Remodeling will design and build quality pieces that take advantage of the space you have without making your room feel cramped. If you have a room with unusual dimensions that don't accommodate off the shelf products, we can create a custom piece that works. Invest in a beautifully hand-crafted product that will enhance the character of your home and the quality of your life. When prefabricated products don't fit the bill, call (310) 504-2231 for a custom cabinetry solution. All City Construction and Remodeling custom cabinetry is one-of-a-kind. It reflects your lifestyle and your appreciation for quality hardwood products. Call (310) 504-2231 to discuss your cabinetry needs.